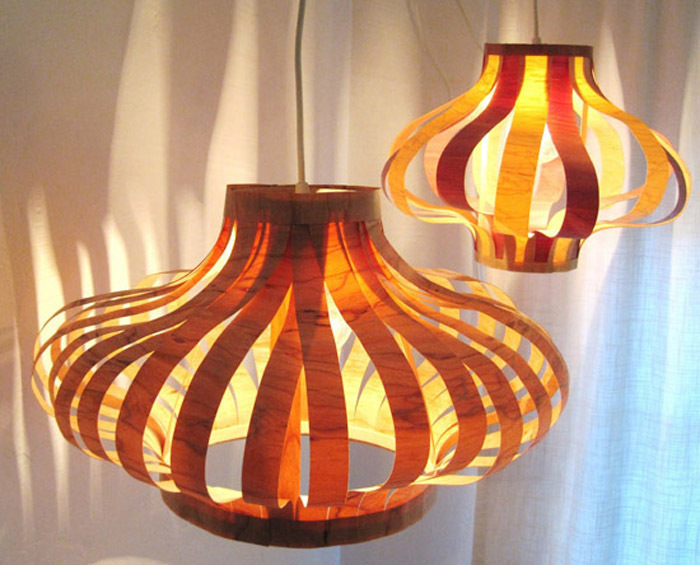 Back in 2011 Holly of The Adventures of an Almost 40 Year Old Intern contacted me about a fun pendant light DIY she had made. The result was this cute little set shown here and how fun that there was a similar one you could buy at West Elm, about a year later. Continuing with our Best of DIYs, here is her popular tutorial that she so kindly shared with our readers back then. Recently I visited one of my favorite stationery stores in town and saw these beautiful wooden sheets of paper; a thin veneer made from so many different types of wood (cherry, walnut, birds eye maple, aspen, red cedar, you name it!) and was really inspired by it. 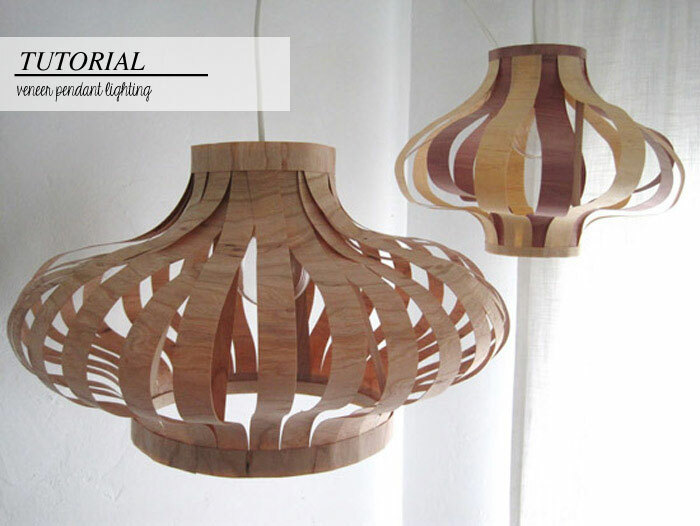 I thought it would be perfect for creating a light fixture (clearly I am on a lighting kick lately!) So, I made some (two of them to be exact) and I didn't think it was possible but I love these just as much as my brass pendant diy! 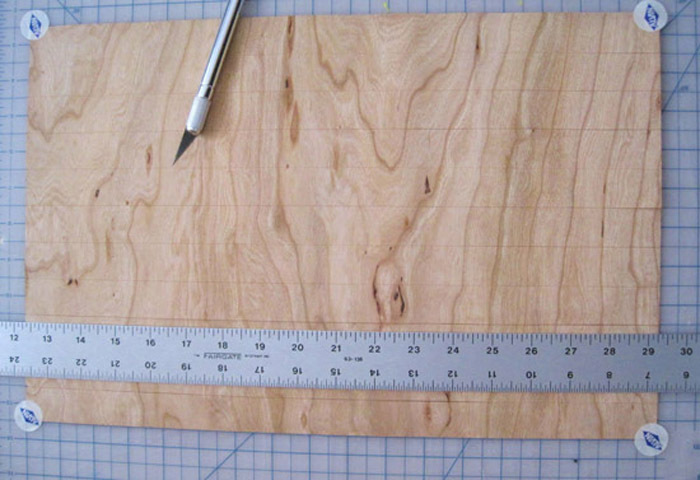 1 piece of basswood measuring 1/16" x 4" x 24"
While that part is drying cut 1" strips of paper that are each 17" long. Note: I was careful to keep them in order because I wanted the wood grain to match when i glued them. 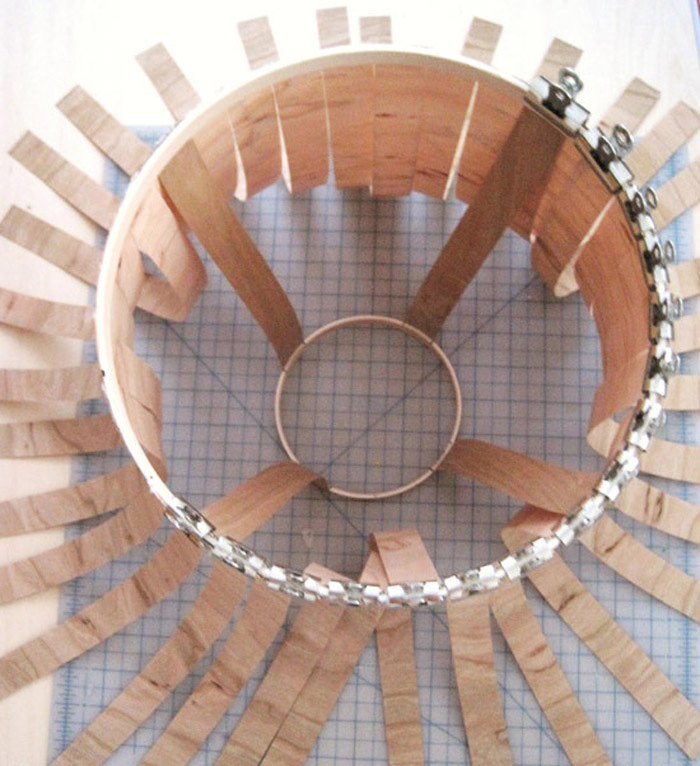 Begin attaching the wooden paper to the large hoop first. 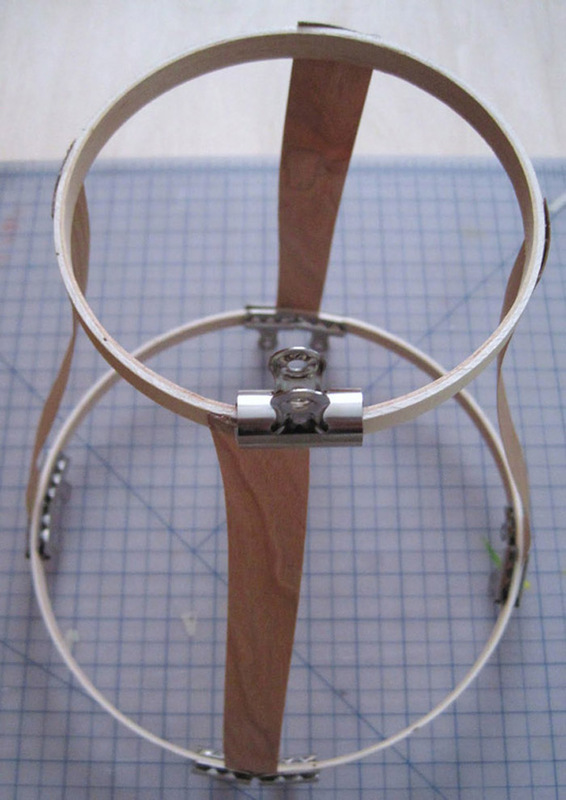 as you attach them, line them up with the top of the hoop, clip the outside of each piece in order to hold it. note: i ended up buying and using a bunch more clips than I started with in order to be more efficient with my time. 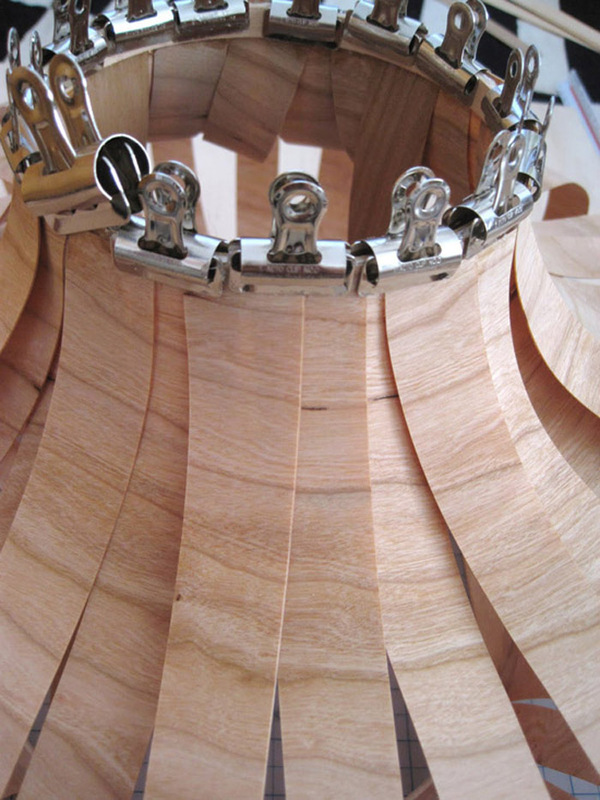 After finishing with the large hoop, move on to attaching each end to the smaller one. Note: here I had to overlap the strips of paper in order for it to fit onto the smaller hoop. I was careful to keep the grain lined up. 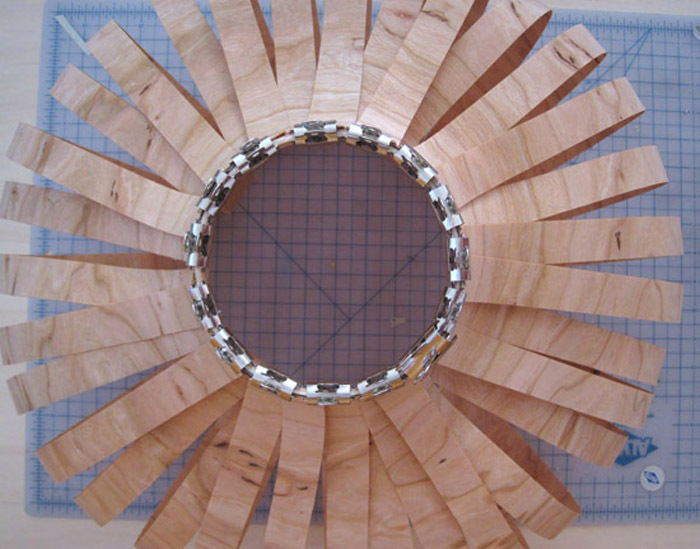 Once dry, use a 17" long 1" wide strip of paper to wrap around the outside of the smaller hoop to cover glue and seams and use two 17" strips to wrap around the outside of the larger hoop. To create the piece that will hold your pendant, trace the inside and outside of your smaller hoop onto a piece of basswood. Use your straight edge to draw a line from the inner hoop tracing from corner to corner to find the center of the piece. This is where you will draw a circle large enough to thread your pendant wire through (should be big enough to allow the plug to pass through). 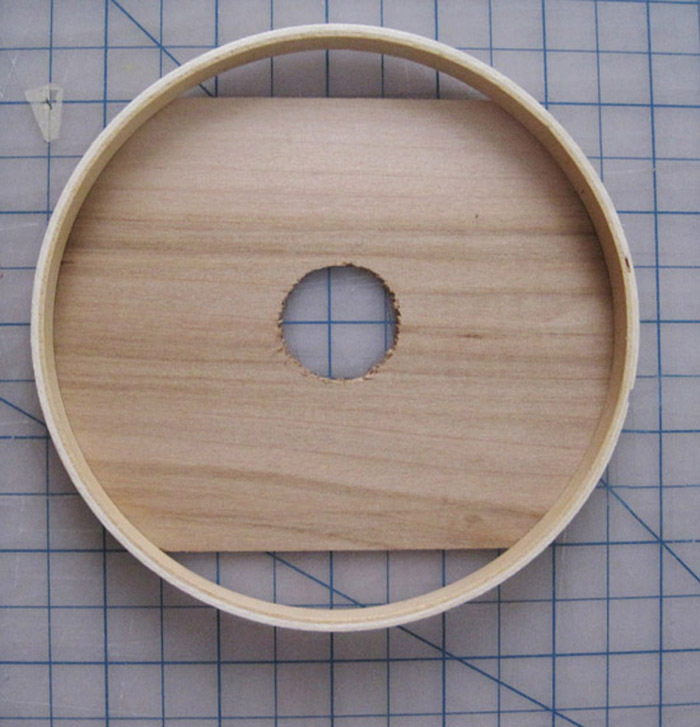 Cut where you traced the outside edge of your hoop as well as the circle in the center . Slide the piece into the top of your fixture from the bottom. You shouldn't need glue as it will be stable with your paper strips holding it. The directions are the same but instead of using a large and a small hoop, I used 2 small hoops. Also instead of using one type of wooden paper i used 2; instead of 1" strips that were 17" long I cut 1 1/2" strips; and I used 2 short braces instead of 4. For these lights I am using a super duper low wattage bulb. I did order fire retardant spray to apply to them as a precaution but it didn't arrive in time for this post so I don't know if it will affect the wood. For those of you just tuning in and wanting to know more about Holly you can by visit here here and on facebook and twitter! These are beautiful! I love the raw look of the wood veneer. They kind of remind me of the paper lanterns we used to make at school. Amazing job! These are GREAT! I've been looking for ways to restyle my lanterns. I guess I can just make a brand new one. Love this look. Thanks for sharing. These are gorgeous! I wish I had a good spot to put one of these in my house! I'm really sorry to say that, but as far as I know veneer is not a good thing: it takes a lot of wood to make one of those sheets, for, say, a 0.02 mm thick sheet you have to throw away a lot, like many times more than 0.02, depending on the kind of saw used... for something whose purpose is only decorative, maybe it's not worth the loss. Why not rethink that great idea with a more sustainable material? After all, the reason why we like those fixtures is that they bring the beauty of nature, right? Nice post amazing lamp cover creation.